Happy Friday! What are your plans this weekend? I am looking forward to a nice relaxing weekend filled with good food, great company and sleep, lots and lots of sleep. Who’s kidding who, I am also looking forward to reading late into the night until my eyes can barely stay open and my brain is filled with wonderful stories. I am a true reader at heart. If given the option, I would chose to read over many other activities. I get totally engrossed in the stories and often want the books to go on forever. And paper, the books must be paper. No electronic books for me. I prefer to hold the book in my hands and feel the paper between my fingers. Love it! 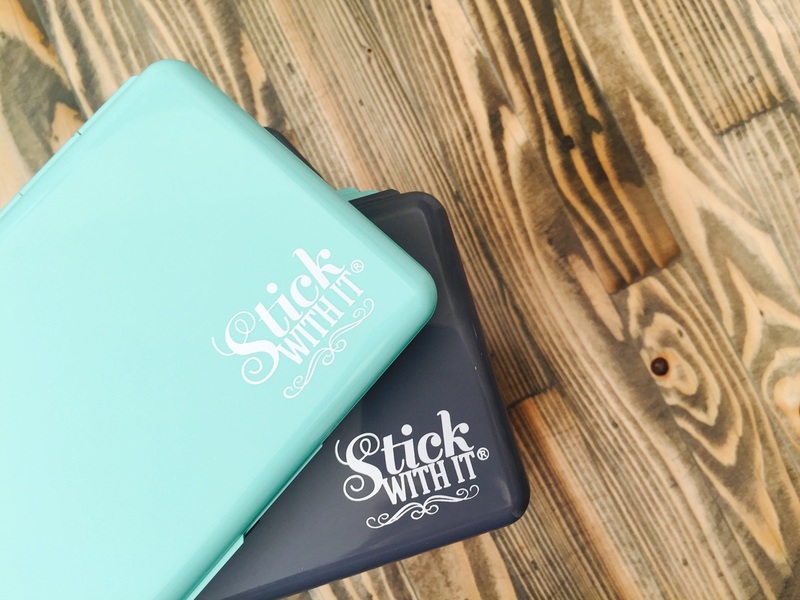 This week I am excited to tell you about a product called the Stick With It Palette. It is definitely one of those products that once you have, you cannot imagine how you survived without it! This is a very busy time of year and while I love to spend time creating, I often have to stop before I have finished my project. One of my pet peeves is having to clean up all the pieces that I have pulled out to use on the project but risk losing or misplacing if I don’t put them back away. Enter the Stick With It Palette. Originally created as a portable makeup palette, organizer and case, this product has so many more uses than just makeup. 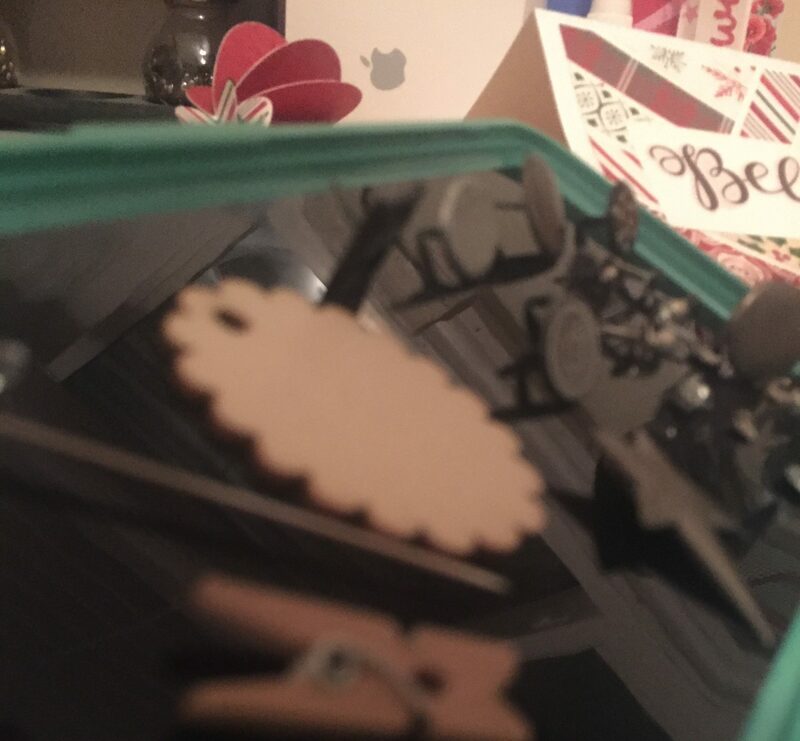 As soon as I heard about this case, I knew it would be the perfect place to store my little bits and pieces in between crafting. When you open up the case, you will see Clingfinity on each side. While it looks like it might be magnetic, it is not. This surface is simply nice and sticky. Sticky enough to hold your small items in place without actually making the pieces themselves sticky. When I first peeled off the protective plastic film, I decided to test out the strength of the hold of the Clingfinity. I was pleasantly surprised. I stuck small pieces, larger pieces, wooden and metal embellishments, paper dies cuts, and the list goes on. I even played around with brads of varying sizes to see if they would stick to the case using the pointy end of the brad versus the flat side. It all stuck! You can see the various brads I set on the top side did not fall as I lifted the side up to close the case. Monetta Plassmeyer, the founder of Mettano Designs, recently filmed a quick video at the Scrapbook Expo to introduce the Stick With It Palette to our audience. Monetta Plassmeyer would like to give a Stick With It Palette to one lucky Scrapbook Expo friend. For your chance to win this wonderful prize from our friends at Stick With It, leave a comment on this blog post. This giveaway runs until midnight on Thursday, December 10th. Last week’s Freebie Friday post was sponsored by Kraftin’ Kimmie Stamps. Thank you to everyone who commented on last week’s blog post! The giveaway was for the Holly Jolly, The Magic of Christmas and No Peeking stamp sets. The winner is Rosalie Ridle! Congratulations Rosalie! Please send your mailing address to Jen Walker and include ‘Kraftin’ Kimmie Stamps prize winner ’ in the subject line. Thanks for joining me this week. I hope you have a wonderful week ahead! Don’t forget … if you want a chance to win a Stick With It Palette from Mettano Designs, you need to leave a comment on this post. Until I see you again next Friday, remember to join Scrapbook Expo on Pinterest, Instagram, Facebook.and on the Scrapbook Expo YouTube Channel for lots of amazing inspiration. This entry was posted in Freebie Friday and tagged Giveaway, Mettano Designs, Stick With It Palette. Interesting product! One of my pet peeves is having to clean up my pallet before I’ve finished my project. This looks like it would solve that problem perfectly! No more wasted inks and paints and a snap-shut case! It looks like a fantastic product to put order on my craft table. It would be great to win one. Thanks for giving us the opportunity ! Wow what a neat tool! I’m always hunting around on my craft table for all of the little embellishments that I use in card making. This is fabulous – I am a “messy” crafter! 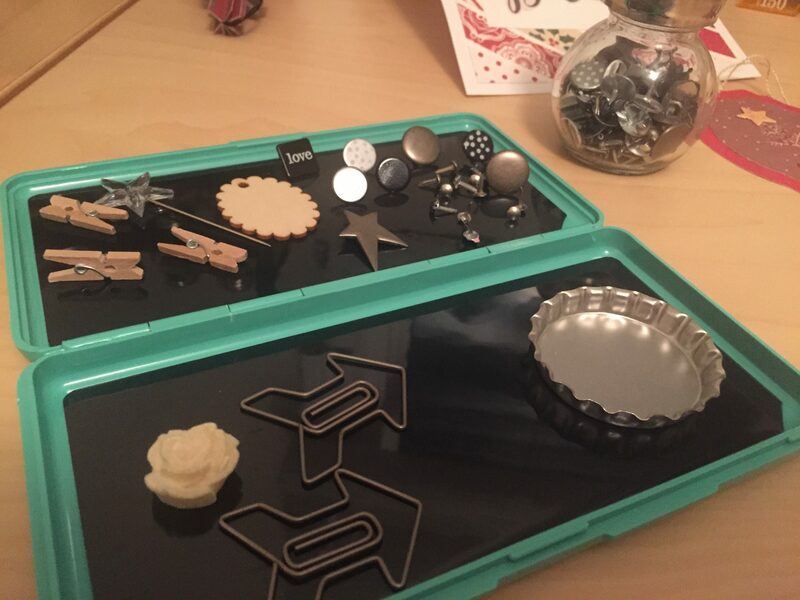 I sure could use this to organize all of the stamps and dies I am working with until I have a chance to clean my area and put them where they belong! Lots of great uses for this – thanx for sharing and the chance to win this neat item!! I can’t wait to use this at a crop, where has this product been, it’s awesome! What a great product! All those sneaky little items that keep getting away from me would now have a place to stay put. Thanks for the chance to win this new “cool tool”. This would be great for traveling! What a great tool. I would use this for every project! Hope I win. What an ingenius idea! I can definitely use this!! What a great product to keep all my card making embellishments at hand and off the floor as I work to create! It’s even small enough to take with me in my craft tote! This product would be great for me. I make cards but I also make jewelry and I could use this for either hobby. What a great new product. Fingers crossed lol. Great idea! I’m always losing my little embellishments I’ve just sat out for my project!! Rope ’em in and keep that brightly colored box from being lost in the piles! Love it! This item looks very cool, and so versatile! I could see using it for papercrafts, sewing, woodworking (no more lost screws), and more…. Would love to win one, may have to ask for one for Christmas if I don’t win. Perfect for my needles. Thanks! What an ingenious idea! Can’t wait to get my hands on one!!! I DEFINITELY CAN USE THIS, I HAVE LITTLE ITEMS ALL OVER THE PLACE! I now know hat I want to get for those folks who are hard to shop for! This would be so great to take items that I would need to use at the craft shows in which we participate. I would one. I’m going to my first expo in Dallas. I’m so excited. I would like to win one of these I could find lots of uses. I make cards and do scrap booking and use lots of bling so pick me a grandmother can always use some help. This looks like a handy item. It would probably be very quick to place a few items on to head to where you are going to craft. What a fantastic product! Can’t wait to find it. So many uses but especially when scrapbooking or sewing. Always seem to be loosing the little items, beads, sequins, brads etc. Bravo on the idea! Sounds like something I could really use. Thanks for thinking of this. This is the first time I have ever heard of this. I think it would be such a big help when I have mountains of stuff on my craft table while working on cards and then can’t find the little bitties underneath everything when I go to put the embellishments on. I would love one. Thanks for sharing this with us. Have a question, can you put paper bits like flower petals on it or would they tear taking them off? What a great product. How cleaver to find a niche that has always needed to be filled. I would love a chance to win one of these and if not, will be looking to add it to my must have items! Thanks! Wow! This product is so cool! I can really see myself needing and using one of these! I’m always misplacing the embellies I use on my projects. So, frustrating. Thanks for sharing information on this product. And thanks for the chance to win! What a brilliant tool….!!!!! I make all my flowers and I’m always losing the little die’ s amongst all my paper and pretties. I recently did 300 quilled red holly berries Oh how I wish i had something like this to keep them all in check, so thats another crafty target group… You can plan your design without it sliding all over the place.. This would help me so much when I craft with small items. Maybe less things would get lost in my couch and underneath it. Thanks for the chance to win! This would be great in helping me make my jewelry. It’s hard to keep beads in place when I’m trying to arrange them. Then I could set them so I could string them together easier. I spend a lot of time messing with arrangement and stringing. That would be perfect to keep my stuff tucked away between working time to hide from the cat and my daughter. Leaving it out loose…..who knows where it will be found! I can think of a zillion uses for this for MY crafting world!! My mind is spinning!! I will need alot of these! That is so cool! Thank you for the opportunity to win one! Thank you so much for doing a giveaway on the Stick with it palettes. This concept is fantastic! I can’t wait to get 1 of these, however winning 1 would certainly brighten up my day. I would love this handy little box!! Awesome! !! I can see lots of these in my craft room..probably different colors for each project because I work on cards and scrapbook pages together..